First we chose great heritage apple varieties with a century-plus track record here on Salt Spring Island. Then we added modern, naturally disease-resistant varieties that never quite caught on, despite their great qualities. Then quirky varieties from around the world that make it easy to see how the apple really is Earth's greatest fruit. We sought out traditional cider varieties that may be virtually inedible fresh, but sure add character as part of craft cider. And then we added more of each. And more. And more. After seven years of this, we surpassed 365 varieties in our orchard: truly an apple a day. Yes, it's our obsession. We like to do our research first, then jump in with both feet and learn from experience. Here's what we're up to. We sell certified organic young heritage and connoisseur apple trees in pots to folks on Canada's west coast. We're growing more than 365 varieties of apples. Seriously. That many. And each of them is unique. Check 'em out. We've got certified organic heritage and connoisseur apple trees for sale! Potted one year whips (trees grafted last spring) of many varieties are now available for $35 each, plus GST. We offer discounts for larger orders starting at 20 trees. You can also place an order for custom grafting, which we do in March of each year, for delivery in the following fall. We have more than 365 different heritage and connoisseur varieties of apple trees. The varieties we have available at any one time vary, depending on what we graft and how quickly each variety sells. Please come and visit us on beautiful Salt Spring Island to select your new apple tree. If that doesn't work for you, we may be able to deliver your new tree right to your door if you're located on Vancouver Island or B.C. 's Lower Mainland and, in March of each year, we can mail bareroot trees to other locations in Canada. Please note that export requirements and quarantine rules stop us from shipping outside of Canada or to the Okanagan Valley. We are NOT able to ship to the United States. Sorry about that. 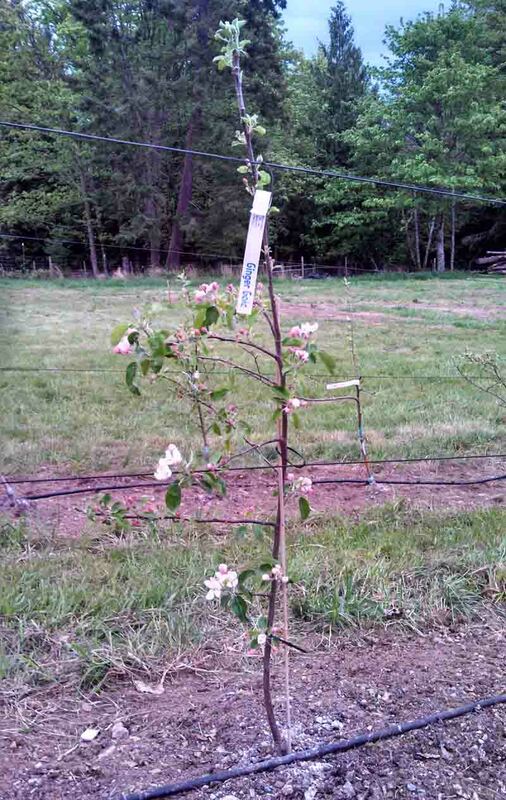 We've got Salt Spring Island's only high density organic apple orchard, growing about 1,200 trees per acre -- 3,387 in total -- using the 'tall spindle' method of training our trees. We’re inspired and motivated by Salt Spring’s beauty and agricultural advantages, its history as western Canada’s one-time primary supplier of apples and the renaissance of apple growing that’s underway on the island. We planted our first 360 dwarf trees in late 2011 and continued planting annually until we were fully planted in early 2016. Since then, we've been replacing dead, damaged and sickly trees and finding ways to cram a few extra into our orchard here and there. When it’s in full production, we expect to harvest something more than 30,000 kilograms of apples each year. We grow organically because it’s good for our health and yours. It’s also good for our natural environment. Going organic means adding only natural fertilizers and minerals to the soil. The result is healthy fruit and healthy land, an orchard that’ll be sustainable over the long haul. We applied for organic status during our early months on our property, became transitional to organic status in 2012, our first full year on the property and were granted full certified organic status by Islands Organic Producers Association (IOPA) in 2013. Being certified organic is different from just saying we grow organically. We must report on everything we apply to our land -- whether it's composted manure to feed our trees or sulphur to discourage the spread of disease -- and we undergo an inspection every year. Growing organically doesn't necessarily mean never adding anything to the soil or never spraying our trees. It does mean using no chemicals and only applying something when there's clear evidence that it's needed. When we need to apply something to our orchard, we only use naturally-occurring materials that are permitted under the Canadian Organic Standards and also by our certifier (which is even more stringent than the organic standard). And it means only adding something when we've got evidence that it's necessary and never just as a matter of routine practice. All of this requires careful record-keeping on our part and it involves paying for each inspection, on top of an annual fee to be part of IOPA. And we think it's worth it. Boron (a natural element contained in some sedimentary rock), which we apply in very small amounts, because our soils have been tested as low in this micronutrient, which plays a key role in flowering and fruit production. BtK (a naturally occurring soil bacteria), which we only spray in huge caterpillar years (we last used it in 2012), to help battle tent caterpillars when they are so numerous that our trees would otherwise be stripped clean. Composted horse manure (which we get from horse owners on the Saanich Peninsula and compost on our property), to add organic matter and modest levels of nutrients to our nursery and at planting in our orchard. Crushed limestone (agricultural lime, which we get from Vancouver Island, where there are substantial limestone deposits), to slightly reduce the documented high level of acidity of our soil and add some magnesium and/or calcium, both of which our soils lack. Lime-Sulphur (a liquid mixture of lime and sulphur), which we use one or two times each year during the dormant season to reduce fungal disease pressures. Liquid fish fertilizer (which comes from a sustainable fresh water fish farm near Powell River, B.C. ), to feed our trees with small amounts of nitrogen, phosphorus, potassium and micronutrients, all of which have been tested as low in our soil. Liquid kelp (which comes from seaweed), to provide our trees with micronutrients that are also lacking in our soil. Sulphur (which comes from underground deposits and we mix with water to spray on the foliage), to help reduce fungal problems such as apple scab and powdery mildew. Zinc (which comes from rock), in very small amounts, because our soils are deficient in that mineral. Lack of zinc can lead to premature yellowing of the foliage and stunted growth. The tall spindle is a training and pruning style suited to locations where land is expensive, as it packs a lot of trees into the space available. But it doesn’t crowd so many to require chemical fertilizers; after all, we’re 100 per cent certified organic! The tall spindle involves training dwarf apple trees to grow relatively tall (about 2.5 meters) and narrow (about one meter). We train branches to grow out instead of up and prune them off before they become too big or too old, which encourages new small, fruit-producing branches to grow. This keeps the tree modest in size and highly productive. Our tall spindle orchard uses a three-wire trellis to support the trees. We don’t train branches along the wires (espalier). The trellis is entirely to keep our shallow-rooted dwarf trees from tipping over when they are full of fruit. With nearly 1,200 trees to the acre, it’s more economical to install the trellis – which uses logs harvested from our property as posts – rather than to stake each tree. Our initial planting of 360 trees was just ten rows, each 44 metres long. The full orchard includes more than three kilometres of rows and 3,387 trees. Starting an orchard from scratch is a lot of work, but we get to grow exactly what we want. This decision is important, because apple trees are a long-term proposition; we don’t want to be ripping them out just because we change our minds. We started out thinking we'd grow something over 100 varieties, which might seem kinda crazy. But then we got crazier and have now settled in with better than 365 varieties, one for every day of the year. The vast majority of these are heritage and connoisseur apples that are difficult (or impossible) for people to find in grocery stores. Our goal has been to grow unique varieties and little-known favourites that are well-suited to organic growing and will flourish in our coastal climate. We're growing more than 365 varieties of heritage and connoisseur apples on our modest five acre Salt Spring Island farm. Read about them all here. Our certified organic orchard of 365 heritage and connoisseur apple varieties is home to Ciderworks cidery, sales of our fresh apples and apple treats, Salt Spring Apple Company apple tree sales and our orchard-front, oceanview B&B @ Salt Spring Apple Company.